A few years ago, I started to suffer from severe pain in the right hip, which later turned out to be the end stages of osteoarthritis. It had kept me awake for many a sleepless night. The ghastly nightmare that suddenly loomed one dark night and woke me up with a start was the last thing I felt I needed at that time! I was awakened by my own screaming and suddenly felt frightened and all alone… overcome by a wave of fear that coursed through my whole being. I felt lost and alone in a dangerous world. It triggered something in me … deep emotional pain from the past. I was brought up in poverty with an alcoholic, mostly absent father and an overstressed highly strung mother of five. Constant worrying and stressing took up so much of her time there wasn’t really any left over for us. Taking on the role of carer for both of my parents, my needs were often last on the list. It was a love-pain relationship, a life of self-sacrifice and I was left longing for a love that never came. I believe pain is here to get our attention and if we don’t listen it just gets louder and louder until we are ‘driven’ to do something about it! I realized I was faced with two options. 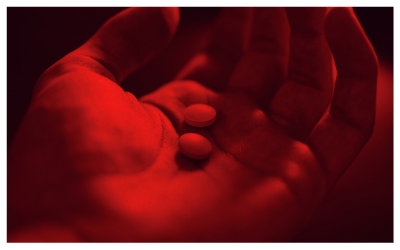 I could continue to take the conventional ‘surface level’ path of pain management and start yet another course of even stronger pain-relieving medications – and for the first few days, I did exactly that, as an emergency measure. When the doctor asked me where it hurt, he was referring to the physical pain. I let him know it was my hip, that my movements were stiff and restricted and that some related areas like the right groin, knee and lower back were also in pain. He examined me by moving my leg mechanically up and down and from side to side to see where it hurt. The whole process produced more than a few ‘ouch!’ noises, some prescribed medication, a physio appointment and a referral to the orthopedics department of the hospital for more specialized investigation. However, my recent qualifications and experience in Inner Journey Therapy and EFT (Emotional Freedom Technique) led me to start addressing the pain at a different and deeper level. When I turned inwards and asked my deeper self where the pain was, my hip whispered in answer, ‘Feeling unsupported and unloved’. I experienced an inner urge to let go and resolve these issues, to come to some kind of completion, in order to move on and step forward confidently in life again. I found myself opening to a place of peace and deep inner support as I let go of the emotional pain of the past that had apparently been stuffed down into the very cells of my right hip. At the same time, I found the hip pain going down so dramatically that I didn’t need to continue taking the pills anymore. What a great relief!